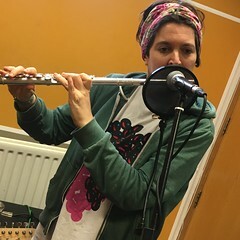 Sebastian Melmoth, Stereocilia and Madame Pamita all contribute LIVE music to Hello GoodBye this Saturday lunchtime on Resonance FM from noon until 1.30pm (GMT). Sebastian Melmoth stumbled from out of the desert sometime in 2010. They were tired, hungry and in need of a good drink. It seems that the barren wasteland from which they emerged, provided this group of vagabonds with copious unfathomable treasures. Jan-Carl Raspe, evidently the wisest stooge, was seen sporting a bass guitar as he trudged wearily into the nearest saloon. The regulars have since been known to recount stories of Raspe’s prodigious skills behind the computing machine – drum loops and soft synths galore – a myriad of sounds beyond the reaches of the imagination. Ulrike Meinhof, fresh from her resurrection, amazed the locals with her custom-made threads, fabulous haircut and beating rhythms so infectious, they set the stray dogs into a rabid frenzy… not to mention the male population of the town. Andreas Baader, arguably the most handsome of the three, immediately made for the brothel. Within minutes, soothing guitar melodies began emanating from the open French windows on the second floor. In accompaniment, he sung poetry so profound, it melted the hearts of all the loose girls in the place. After a sleepless night of demonic revelry, this band of misfits once again reunited under the misguided pretence of making music together. It may not be the most fervent career choice and it seldom pays, but they say it is good for the soul. And so, ever since that point in time, Sebastian Melmoth (it is rumoured that the name is a reference to Oscar Wilde) have endeavoured to share their theatrical, cacophonous art with any bright spark who would lend them an ear. Stereocilia is London based guitarist and sound artist, John Scott. John uses his guitar and live looping techniques to create dense, rich layers of sound. Over the past 10 years John has performed all over the UK and Europe with various projects. He has also presented work for live radio broadcasts, and soundtracks to short films. Last year he was chosen to perform with 100 guitarists for the UK debut of Rhys Chatham’s, ‘A Crimson Grail’ at the Anglican Cathedral in Liverpool for the Biennial festival. John is Debut album will be out on the 25th November on his Echoic Memory imprint. Madame Pamita uses the powers of euphonious prognostication to tell audience member’s fortunes and plays songs written both by herself and by those who have moved on to the great beyond: rural blues, old time, jug band and proto-jazz numbers about romance and revenge and mirth and mayhem. She plays on an assortment of odd antiquarian instruments (Imperial Banjeaurine, Banjolele, Marxophone, Polka-Lay-Lee, and Tiple; as well as a 115 year-old banjo and early 20th century ukuleles). This entry was posted in dexter bentley, hello goodbye show, Hello GoodBye Show: Listings Info, resonance fm and tagged madame pamita, sebastian melmoth, stereocilia. Bookmark the permalink.